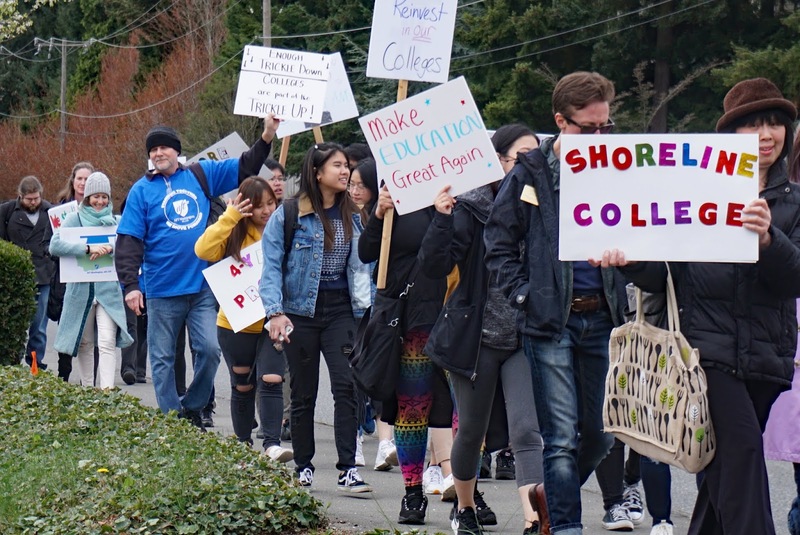 Shoreline Community College faculty and supporters joined the three Seattle Community Colleges and Port Angeles' Peninsula College in walking out on Tuesday to call attention to the low wages and lack of state funding for the two-year community colleges. "...the state of community colleges is bleak: over 70% of faculty are adjuncts, we have quarter-to-quarter contracts, minimal job security, and dismal pay. "Adjunct faculty are often forced to teach at multiple colleges, take additional part-time jobs, and file for unemployment over breaks. Classes can be cancelled at the last minute, leaving faculty struggling to pay their rent. "Our full-time counterparts are struggling too." SCC held a teach-in on campus in the morning, and then marched down to 160th and Aurora in the afternoon. 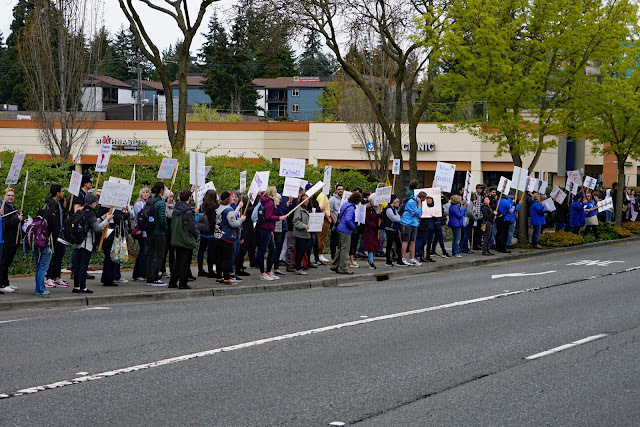 "Of 330 Seattle Colleges faculty who responded to a union pay survey earlier this year, 84% said they worked more than one job or depended on another person’s income. About one-fifth of faculty who responded said they worked three to five jobs. Three-fourths said they’ve considered leaving the district to pursue better pay or opportunities elsewhere." What are they asking for with the rally? Ecke says, "...contact your legislators before April 28th and tell them to REINVEST in our community and technical colleges."